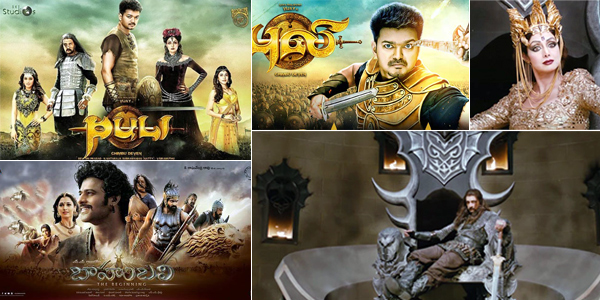 Raaga.com: Will Sridevi –Vijay starrer PULI out beat BAAHUBALI - THE BEGINNING? Will Sridevi –Vijay starrer PULI out beat BAAHUBALI - THE BEGINNING? With S S Rajamouli's BAAHUBALI - THE BEGINNING shattering all box office records all eyes are now set on Sridevi and Vijay starrer PULI, another similar fantasy costume drama that has gripped cine buffs. What makes the movie interesting is the clash of south superstar Vijay and Bollywood queen Sridevi, retuning to South cinema after many years. In addition Sridevi, unlike her recent roles will be seen in a glamorous avatar playing a negative role of a vicious queen of a mysterious kingdom. South mega star Sudeep too looks unbeatable in the role of a malevolence King oozing terror. And last but not the least Vijay as the undisputed super hero plays a dual role thus giving double the worth of delight. In nutshell the movie appears to be complete paisa vasool but will it out beat the visual and emotional content of BAAHUBALI - THE BEGINNING is yet to be seen. Directed by Chimbu Devan of the hit film IMSAI ARASAN 23AM PULIKESI fame, the film has generated much excitement and enthusiasm among the viewers ever since its trailer has been released. The captivating trailer with eye catching visual and mindboggling special effects has become the most viewed trailer on the internet. Reports claims the trailer has attracted over 3.4 million views and close to 76,000 likes thus becoming 2nd most 'liked' Indian film trailer after Salman Khan's KICK (with more than 1 lakh likes). However as the movie fans anxiously await the film’s release the film is getting delayed due to unavoidable circumstances. The movie that was originally planned to be released September 17 has now been pushed two weeks ahead and will be released on Oct 1st, 2015. The producers SKT Studios tweeted recently about the delay citing extensive post production and CG works as the reasons for the movie’s delay.